Yes, an update has been a while in coming, and most folks are wondering whats been going on, so heres the latest update from the Task Force http://detectingrights.com/update-january-15-2014/. After many years of volunteering his time and efforts, the President of the Task Force, Carter Pennington, has resigned. Finally an update from the Task Force! 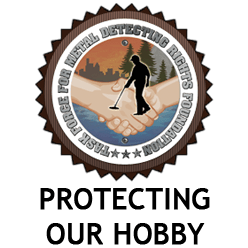 It’s been a while since we’ve heard anything from the Task Force for Metal Detecting Rights. After checking their website and Facebook page, which hasn’t had any updates in half a year, I was wondering what they have been up to, so I inquired. There is a lot going on behind the scenes. Keep your eye out for and update to their website www.detectingrights.com. They are having (or have had) a meeting with the metal detector manufacturers. They are trying to figure out how to best utilize the money donated to them by Minelab. The Task Force is run by volunteers, and things run at a slower pace, however, I’ve been told they are moving along.